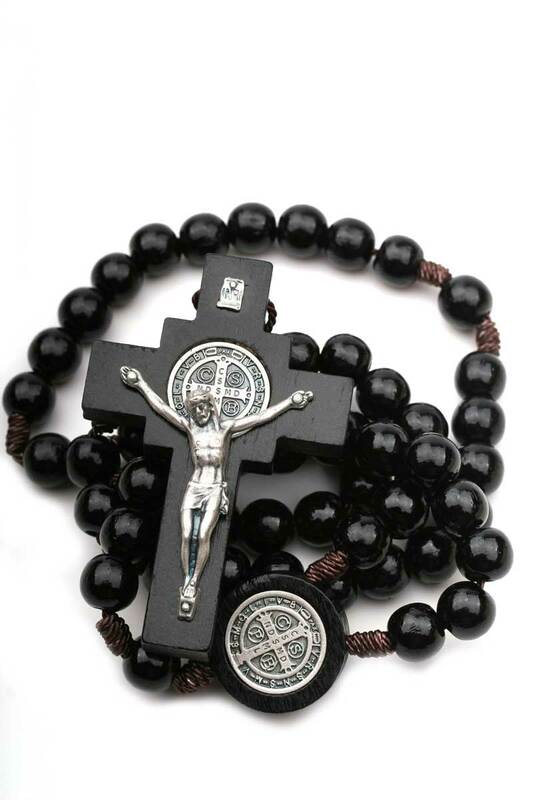 This wonderfully constructed, quality wooden five decade rosary is suitable for both men and women. 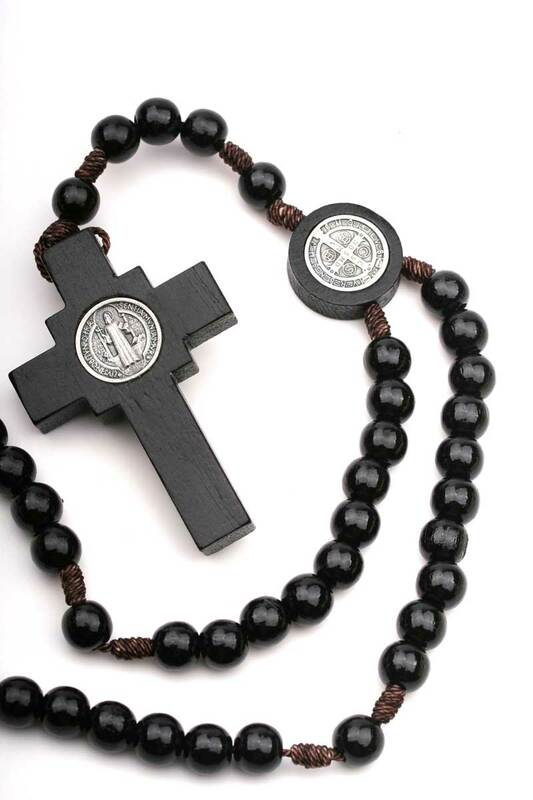 This St Benedict intercession rosary features large 10 mm black wood beads mounted on a strong rope to withstand constant tugging and pulling during prayers. This rosary should last you a lifetime. Great for older folks looking for comfortable rosary that is easy to pray with. Due to the size, these prayers beads can also adorn your home altar or hang on a wall by your bed. This one is best for home praying. For the on the go rosary, you probably should find one that is smaller to fit your pocket or purse. The crucifix on this rosary is substantial. It measures 3" in height and is quite thick. It is made of a solid Brazilian walnut wood and is painted black. 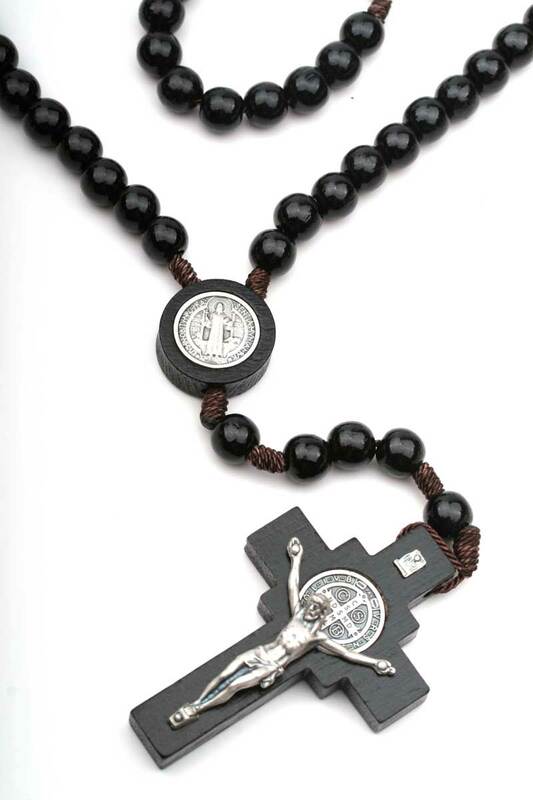 The corpus of Christ is made of metal with a silver finish which contrasts beautifully with overall black tone of the rosary. The corpus is highly detailed and nailed securely to the cross frame. The Saint Benedict medal in silver tone metal is fixed to both sides of the cross directly behind Jesus's head. 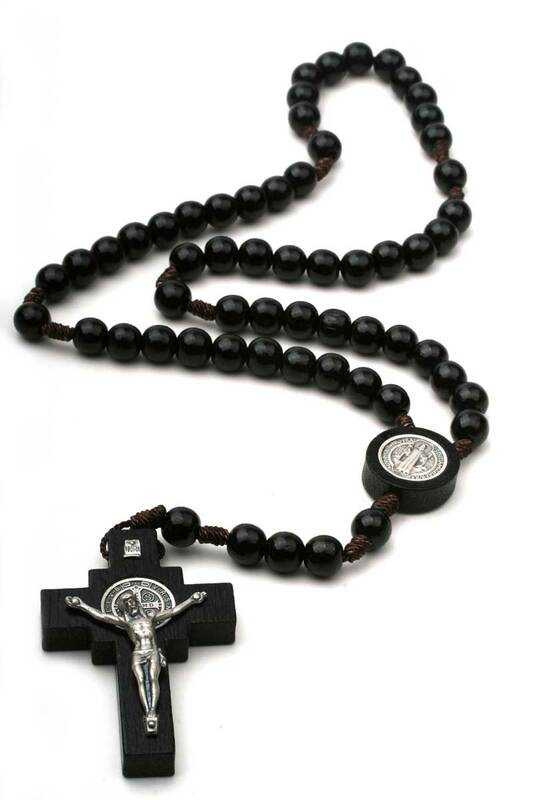 The centerpiece is made of solid wood and black as the rest of the rosary. It is 1 inch in diameter and slightly recessed in the middle to fit St Benedict medal on each side, flush with the wood. The medal is made of metal with antique gold finish. 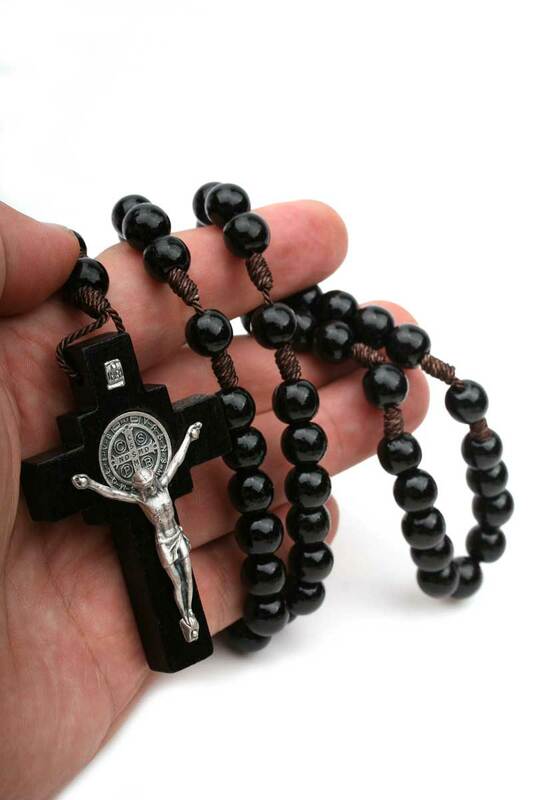 The 10mm rosary beads are made of wood from Brazilian walnut tree. Each bead is round and painted black for smooth finish. Since wood is a natural material there is a slight variation in bead size to make each rosary unique. Both Hail Mary and Our Father beads are the same in size. In each decade set, the Ave Maria wood beads are easy to grasp with some give to allow a slight movement during a prayer. The Pater Noster (Our Father) beads are separated from Hail Mary beads with cord knots. The cord (rope) is made of strong nylon for durability.